Here—something to share. A story. Two men, climbing in the Utah desert, living out of the back of a 1984 VW Westfalia. A tale we all know well. Andrew and I had been gone for three weeks, seeking out desert cracks in Indian Creek. Now we were homeward bound—headed back to Squamish. The van was Andrew's. He's a dedicated dirtbag. Devoted to the climbing life. Devoted to the freedom of it. The exhilaration of being gripped hundreds of meters off the ground; the warmth of the sun on your skin as you swim up another perfect crack; the blissful spontaneity of a life on the road. This is why, two years ago, he jettisoned everything, came out West and set up shop in a van. We were on the I-90 now, thirty miles out of Seattle, coming down the Snoqualmie Pass. I was driving. Then, a burning smell. Loss of power. We pulled over. Smoke coming from the back of the van. From the engine. Fire! We jumped out of the van. Andrew grabbed a fire extinguisher from behind the passenger seat. I watched the flames spread. Time to step back now. Get out. We grabbed a bag each. There was nothing we could do. As the sky darkened, we stood by the side of the road and watched. The windshield warped beneath the heat—a wormhole of melting silicon expanding out from the center. The tires melted, leaving a black rubber syrup that coagulated on the road. The rains of the Pacific Northwest drummed down. 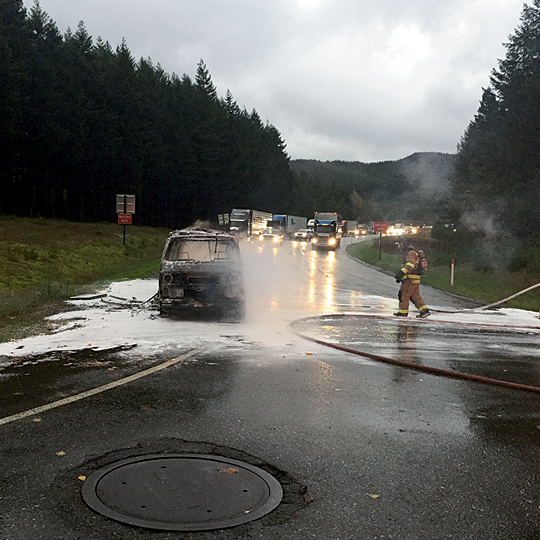 Rain falling upon hills of green—rain falling uselessly on an out-of-control engine fire. A fuel tank full of petrol burns for a long time. The propane tank exploded. A ball of fire licked the sky. Our hair and faces were thick with a fumy, putrid lacquer. There was nothing to say. The police and the fire engines arrived. Applied water. Foam spray. But the damage was done. We stood there, looking at what remained. A smoking wreckage and not much else. Before the tow truck came to take the carapace of Andrew's prized Westphalia away, we approached it. I reached down to salvage a few singed pages from Andrew's favorite guidebook. Bishop Bouldering. "That's my life," Andrew had yelled out, distraught, standing by the roadside. His clothes. His quickdraws. His books. His copy of Alpinist 43. Our favorite issue, featuring Tami Knight's profile of the mythic history of our adopted hometown—Squamish. Maybe Alpinist would replace his copy if I wrote them a letter about it, I thought. Little pages of this or that novel were scattered, with charred edges, across the road. Paper can outlast nylon or goose down it seems. But all possessions burn. The tow truck pulled into the parking lot of a highway diner, and we opened the door, dropping down onto the tarmac. Nighttime. The rain hammered against our skin. And as we readied ourselves for the next leg of our journey back to Squamish, I watched as Andrew gave one last look at the burnt-out husk of his van. 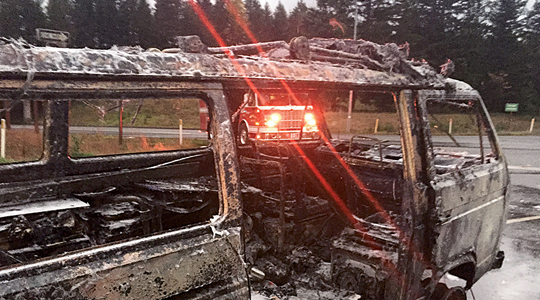 It looked like a charred corpse chained to the back of the tow truck. I asked myself if it was worth it. The price we pay to live this life. The squandered fortunes. The strains on our relationships. The self-imposed homelessness. All these sacrifices, offered up as libations to the mountains. A dedicated climber must become a dedicated ascetic if he is to live this life. We tell ourselves that this is a good thing. Materialism corrupts. All objects are ephemeral. These are important lessons. I shouldered my bag and Andrew shouldered his too and he looked at me, wildeyed—a man without a home. Where to now? Neither of us knew. We just stood there, lit up by the lights of a nearby gas station-discarded, dirty, rained on. As we began planning our next step, we yelled to make ourselves heard over the din of the highway and the storm. The highbeams of intact vehicles passed us by. We loped towards a roadside diner. I reached the doors first. Then, ushering Andrew into the warmth, I turned and looked off into the darkness—at the black night beyond the circle of glowing light. Dark rain falling on darker pine forests. Black. Wet. Cold. Hostile. Is it worth it? I asked myself.